The solar flare which erupted on March 7 was the most powerful eruption ever observed by Fermi's Large Area Telescope (LAT). The flare, classified as X5.4, made the sun briefly the brightest object in the gamma-ray sky. "For most of Fermi's four years in orbit, its LAT saw the sun as a faint, steady gamma-ray source thanks to the impacts of high-speed particles called cosmic rays," says Nicola Omodei, an astrophysicist at Stanford University in California. "Now we're beginning to see what the sun itself can do." At the flare's peak, it was emitting gamma rays with two billion times the energy of visible light, or about four billion electron volts - easily setting a record for the highest-energy light ever detected during or immediately after a solar flare. Current prediction for the next sunspot cycle maximum gives a smoothed sunspot number maximum of about 62 in July of 2013. We are currently over two years into Cycle 24. The predicted size would make this the smallest sunspot cycle in nearly 200 years. 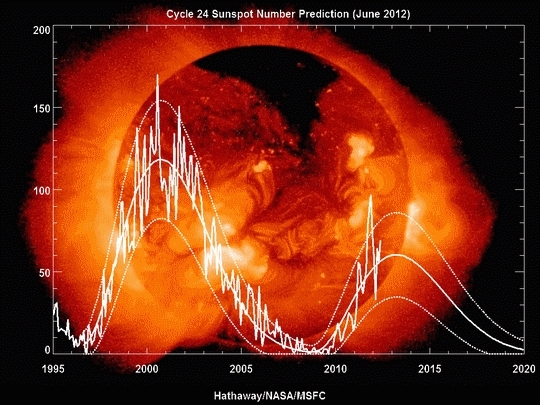 See also David Hatherway Solar Cycle 24 Sunspot Forecast IS Making Solar Cycle 25 Even Worse!